WASHINGTON, DC, September 13, 2011 (ENS) – Senate Majority Leader Harry Reid of Nevada made an impassioned plea today on the Senate floor for increased funding for the Federal Emergency Management Agency, after Republicans Monday night delayed FEMA disaster relief for tens of thousands of people. “This week Republicans sent a message to victims of devastating hurricanes, wildfires and tornadoes: tough luck,” said Reid. Most Senate Republicans voted Monday to block progress on the Senate-originated funding bill for FEMA, on grounds that the bill spends too much money. Senate Minority Leader Mitch McConnell, a Kentucky Republican, said today that the emergency supplemental FEMA measure was “not necessary” until later this month. But this afternoon, Republican senators from states hard-hit by storms and floods joined Democrats in advancing the FEMA funding measure. Senators voted 61 to 38 to proceed on a bill dealing with Burmese sanctions that Democrats have said they will use as a vehicle for a $7 billion aid package for FEMA. FEMA has spent $365 million in the last two weeks to help those affected by Irene and other disasters. 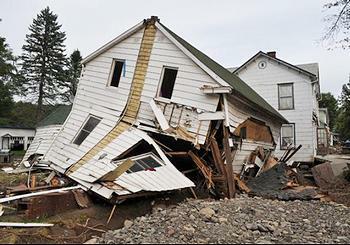 Irene created 100 year flood conditions in several states, including New Hampshire. Funds are so low, FEMA has stopped rebuilding Joplin, Missouri, where more than 150 people died in tornados earlier this year, so that it would have enough money for food, water, and emergency housing for victims of Hurricane Irene. President Barack Obama has issued disaster declarations in 48 states so far this year. On Friday, the White House formally requested $5.1 billion in supplemental funds for the FEMA disaster relief fund to cover the next 13 months. In a letter to House Speaker John Boehner, an Ohio Republican, the President said the supplemental funding is needed to cover the estimated $1.5 billion in costs to the federal government caused by Hurricane Irene, and respond to other disasters. 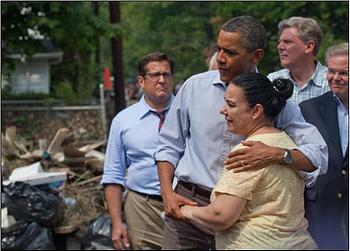 Obama said that FEMA needs $500 million for the remainder of the 2011 fiscal year, which ends September 30. He estimated that FEMA would need $4.6 billion for the next fiscal year. “This request responds to urgent and essential needs,” Obama wrote. Even Republican governors agree it is necessary now to replenish the FEMA disaster fund, which grants money to local governments and individuals to repair disaster damages. Governor Chris Christie of New Jersey sent a letter Thursday to President Obama requesting an expedited federal declaration of a major disaster for the entire state to ensure that state and local governments, as well as individuals, receive federal assistance as quickly as possible for damage resulting from Tropical Storm Lee. Lee closely followed the devastating impact of Hurricane Irene, which displaced New Jerseyans throughout the state, creating the worst floods there in more than a century. President Obama has already signed a federal disaster declaration for all 21 New Jersey counties. Reid accused Senate Republicans of pandering to the Tea Party by not voting to increase funding for FEMA. “Senate Republicans are once again holding Congress hostage to appease the Tea Party. Meanwhile, more than $200 million in disaster recovery projects are on hold,” said Reid. The FEMA funding was approved September 6 in the Senate Appropriations Subcommittee on Homeland Security as part of that department’s 2012 appropriations. The $6.9 billion that was approved by the subcommittee is $4.2 billion more than is provided by the House bill and $666 million less than fiscal 2011 appropriations.